MILTON, Ga. — A non-profit that trains dogs to assist their owners is looking for a 3-month-old puppy they say was stolen from their facility, reports CBS affiliate WGCL. Dorie, a golden retriever, was stolen from her kennel overnight on Sept. 4. The service dog-in-training was last seen as Canine Assistants volunteers locked down the kennels on Saturday, according to a spokesperson for the nonprofit. The puppy’s service vest and other equipment was also stolen. Police in Milton, Georgia are investigating, but suspects have not been identified. 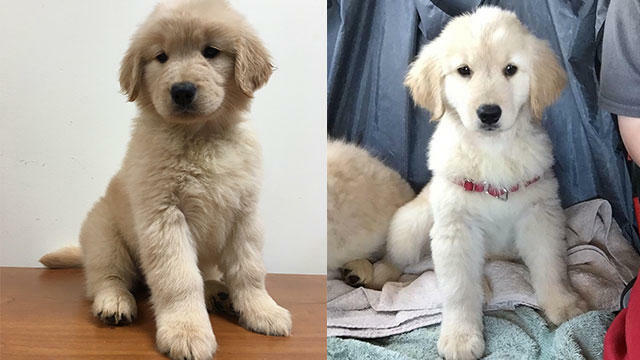 “This is the first time in 25 years we have ever had a puppy stolen from our farm, and considering the facts, we can only assume the person(s) involved knew our system and they had a clear intention to take Dorie along with her service vest,” said Jennifer Arnold, the Canine Assistants spokesperson. After the organization realized Dorie was missing, the organization launched an internal investigation that included contacting over 280 active volunteers who have access to the facility and may have taken Dorie to their home, which is a part of the teaching process. They concluded that no volunteers had Dorie with them. Arnold said the organization isn’t interested in punishing whoever stole the puppy. “Canine Assistants wishes to make it very clear we have absolutely no interest in anything but the safe return of our service puppy, Dorie – her future recipient needs her and we need to find her,” Arnold said. Arnold said Dorie had not yet been outfitted with a microchip, but said Canine Assistants would still be able to identify her if she is found. Anyone with information on the whereabouts of Dorie can call Canine Assistants at (770) 664-7178, ex. 201 or email info@canineassistants.org. Canine Assistans has also launched a Facebook page to spread word about the disappearance: www.Facebook.com/BringDorieHome/.